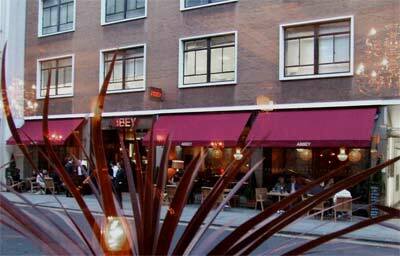 Abbey is a refurbished Bar38, the internal layout is almost identical, there are some new look decorations but primarily it's the same. So the old review remains good - Abbey is a modem styled pub with a large full glass frontage, main ground floor bar and a lower ground bar. I visited on a Wednesday and there was no shortage of seats (as you might expect). As well as the common lagers there are some more unusual ones on draft. The ground floor layout is good, with the bar to your left as you enter and seating on the right along the glass frontage. Access to downstairs is via a metal staircase, where you find more seating, the lower ground bar and the toilets. The pub is large and guessing from the decor and seating tends towards a night club and young City revelers (since I felt out of place).